September 15: The Soviet Group for the Study of Reactive Motion (GIRD) in Moscow was established with Fridrikh Tsander as its first director. After his death, Sergei Korolev became director in 1933. Mikhail Tikhonarov was one of its section directors. Korolev worked mostly on rocket-propelled gliders. 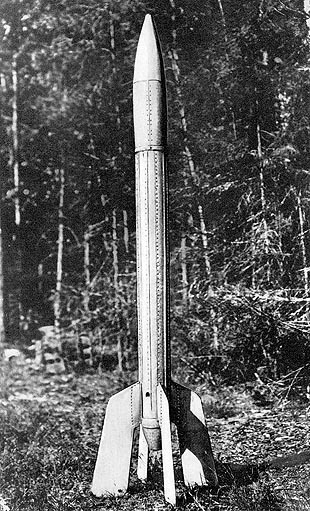 April: The Mirak (minimal rocket) II rocket (built by the VfR in Germany) developed 70 lbs of thrust in static firing before exploding. Fuel was gasoline and liquid oxygen and the nozzle was cooled by liquid oxygen. May 14: The Repulsor-1, a liquid fueled rocket using gasoline and liquid oxygen, rose 200 ft and traveled 2.5 miles. The rocket was built by the VfR in Germany. The engine attempted to use water for regenerative cooling in the nozzle. August 31: The Repulsor-4 (built by the VfR in Germany) was launched to an altitude of 3300 ft and landed with a parachute. Within the next year the VfR would conduct 270 static firings and 87 launches. 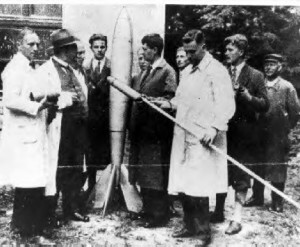 July: The first rocket demonstration by the VfR by Dr. Wernher von Braun and Capt. Dr. Walter Dornbergerfor the German Army was carried out with Repulsor-4, which flew to an altitude of 200 ft.
October 1: Wernher von Braun hired by the German army and drops out of sight. 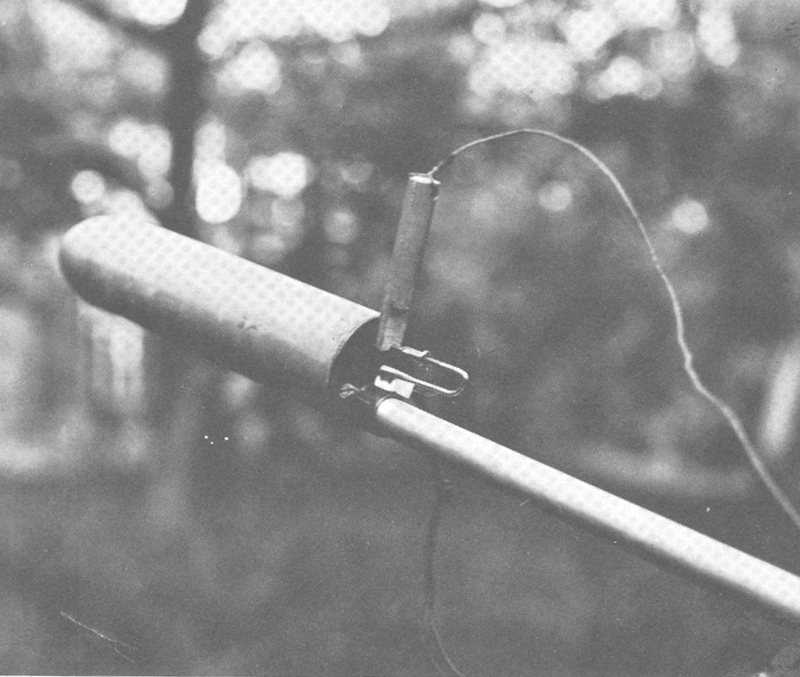 November 12: The American Rocket Society’s Rocket No. 1 developed 60 lbs thrust in static testing. Nikolai Rynin in the Soviet Union published “Interplanetary Space Flight”, a detailed, 9-volume encyclopedia. Valentin Glushko in the Soviet Union published “Problems of Rocket Flight”. 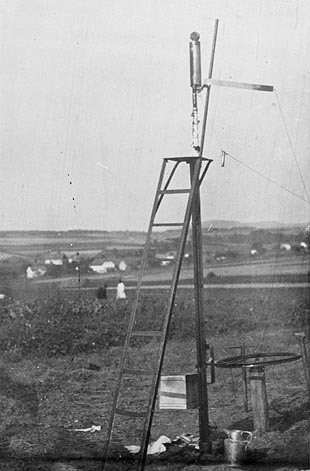 May 14: The first American Rocket Society liquid fueled rocket (Rocket No. 2) was launched at Marine Park, Staten Island, N.Y., reaching 250 feet altitude before exploding. August 17: The first Soviet liquid fueled rocket (GIRD-09), developed at the GIRD, was successfully launched to an altitude of 1300 ft. This was their first successful launch. Developed by section directed by Tikhonorov. September 21: The GIRD and GDL combined to form the Moscow based Jet Propulsion Scientific Research Institute (RNII). November 25: GIRD launches the GIRD-X to an altitude of 1600 ft (the first Soviet liquid fueled engine which used EtOH/LOX). Developed by section directed by Tsander. November: Successful firing at GIRD of the ORM-50 engine designed by Valentin Glushko for the never completed GIRD-05. 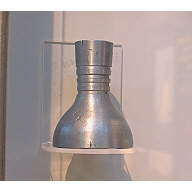 The ORM-50 was the first successful regeneratively cooled rocket engine (Nitric acid/Kerosine). Eugene Sanger in Germany published, “Rocket Flight Engineering”. He began working for the German Reich Aviation Ministry where he would, over the next 5 years, design the “Silverbird”, a sub-orbital lifting body powered by rockets and ramjets that would serve as a space plane, but could also to be used as a bomber (it was never funded). January: The VfR in Germany was disbanded because of internal political disputes and lack of financial support. April 16: Werhner von Braun submitted his doctorate thesis, “Construction, Theoretical, and Experimental Solution to the Problem of the Liquid Propellant Rocket”. September 5: Wiley Post successfully flies to 47,000 ft in Chicago using the first pressure suit This was designed by Russell M. Colley at B.F. Goodrich. September 9: At Marine Park, Staten Island, American Rocket Society rocket (No. 4) became the first to pass the sonic barrier, reaching 700 miles per hour, climbing 400 feet and traveling 1,600 feet horizontally. November: GIRD-07 launch directed by Tikhonorov using Kerosine/LOX using the OR-2 engine developed earlier by Tsander. December: The German Army rocket development group fired the A-2 rocket (660 lb thrust) for a distance of 1.4 miles (altitude of 6500 ft), on the island of Borkum. Jakov Perelman in the Soviet Union published “Interplanetary Travels”. January: Korolev publishes, “Rocket Flight in the Stratosphere”. November 11: Based upon designs by Auguste Piccard, the Army Air Corp balloon gondola Explorer II, manned by Capt. Albert Stevens and Lt. Orville Anderson, reaches 72,395 ft (an altitude record that would stand for 19 years). They take the first photographs that show the curvature of the Earth. This is the first operational sealed cabin. Valentin Glushko (along with Langemak) published “Rockets, Their Construction and Utilization” in the Soviet Union. Tsiolkovsky published, “On the Moon” in the Soviet Union that described interplanetary travel. During 1935 (and continuing for the next 5 years), Dr. Goddard made multiple successful launches in New Mexico (see list in 1930). February: The Germans tested the A-3 rocket with 3,300 pounds of thrust (a developmental model for later military rockets). March 16: The Smithsonian Institution published Robert H. Goddard’s “Liquid Propellant Rocket Development”. During the year, Dr. Theodore van Karman at the California Institute of Technology, Pasadena, Calif., founded a group that began experiments in the design fundamentals of high altitude sounding rockets, and this led to the creation of the Jet Propulsion Laboratory. 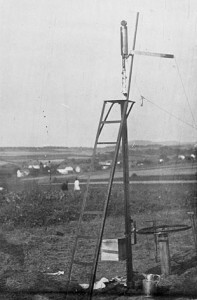 May: The German Army rocket experiment station at Peenemunde was opened, under Capt. Dr. Walter Dornberger. October: A. Shternfeld published “Introduction to Cosmonautics” in the USSR. Successful launch of the Soviet GIRD developed Aviavnito rocket, which reached an altitude of 9800 ft. Mikhail Tikhonarov designed his rocket. 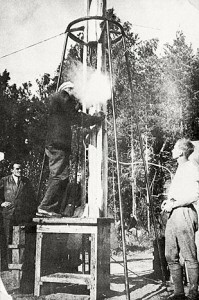 Most of the Soviet GIRD rocket development leaders were arrested and either executed or sent to the Gulag, including Tukhachevsky, Kleimenov, and Langemak. Valentin Glushko (03/23/38) and Sergei Korolev (06/07/38) were both arrested in 1938 and sent to the Gulag for seven years. They were accused of passing rocket technology to the Germans. October: The German Army test rocket A-5, weighing 2000 pounds climbed 5miles before burnout at Peenemunde. September 1: Germany invades Poland beginning World War II. The British Interplanetary Society publishes a study of a manned mission to the Moon.